Putting it all together (this is before adding the drizzle sauce).. I was trying to figure out what to call this dish, so I started googling "make ahead salads" and found this article.. ..I was like, YES. That is exactly what this salad is. Hearty. Make ahead. Bliss. 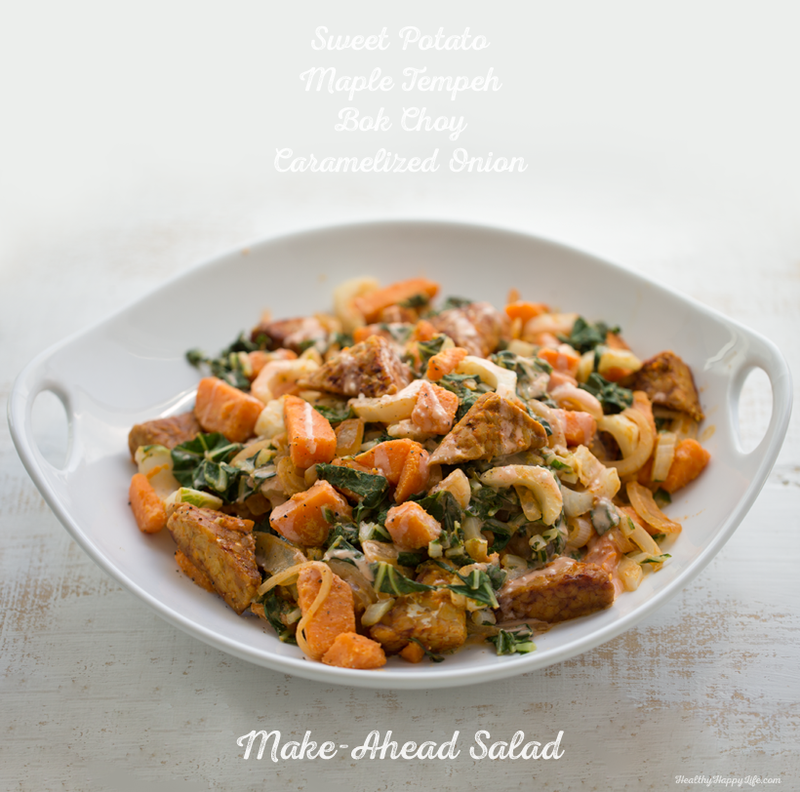 You can pull a hearty-make-ahead-salad (HMA salad?) 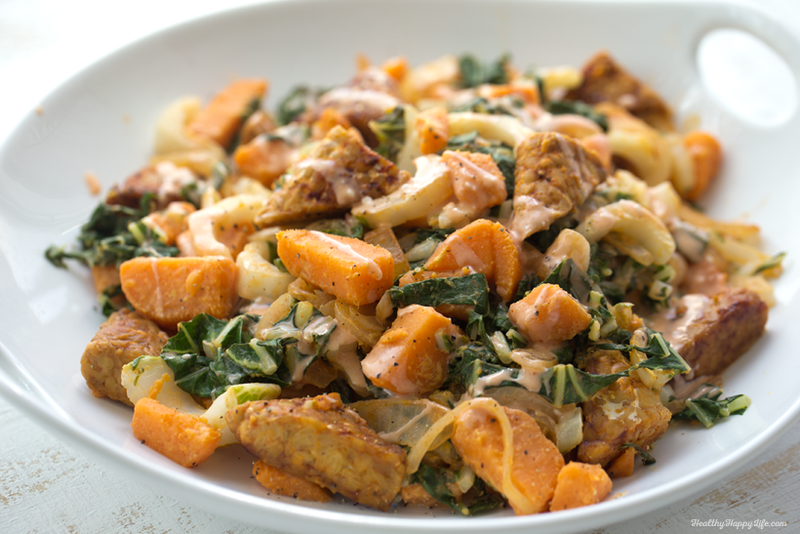 out of the fridge and serve it as a full-sized, protein and fiber and veggie rich meal. No cooking, because you already did all that the day before, or that morning or afternoon when you actually had energy to cook. This Salad. Sweet and savory maple tempeh triangles, delicious and healthy greens from Bok Choy (or sub with another veggie! 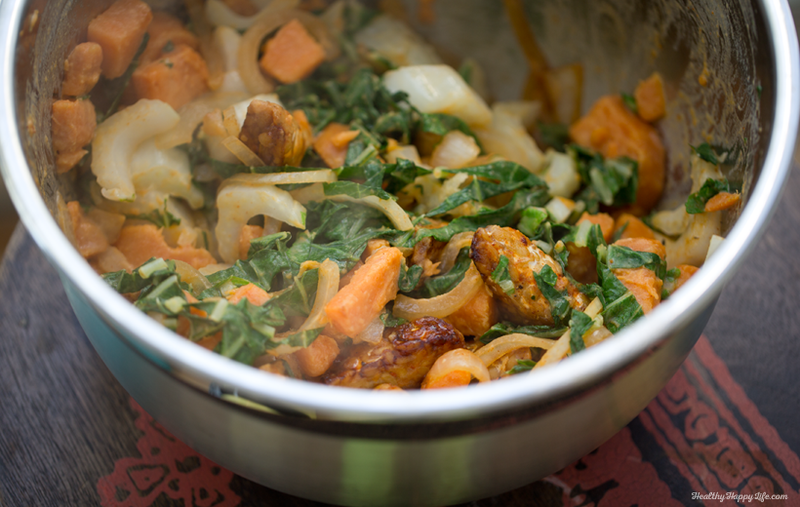 ), caramelized onions and loads of diced sweet potato. Plus the sauce and seasoning flavors are just incredible. So much flavor in each bite. This veggie salad is rich in leafy greens, healthy carbs and plant-based protein. Maple, tamari and spicy flavors throughout. 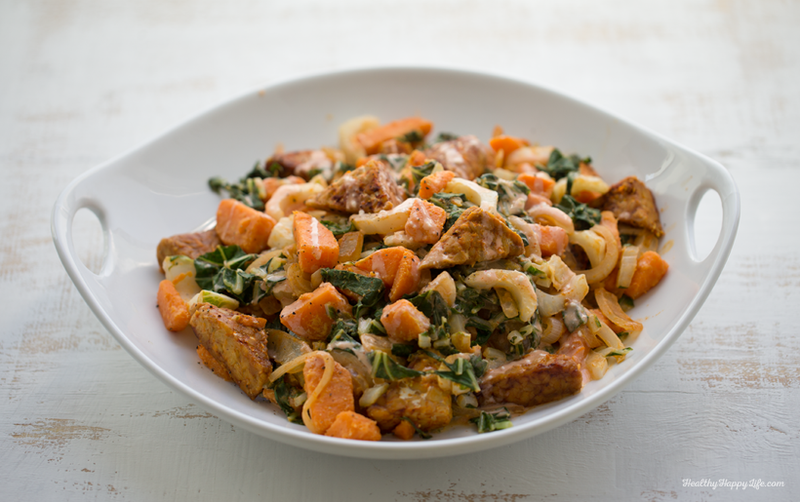 Slice the tempeh and add it to a medium bowl along with the maple syrup and tamari. Toss well and let sit for at least a half hour before cooking so the flavors can absorb and marinate the tempeh. Boil the diced sweet potato until tender but not mushy. Turn off heat. Before draining the hot water, add the bok choy to the pot and close lid. Let the water and heat wilt the bok choy. Drain bok choy and potato and pour them into a large mixing bowl. Spoon in the vegenaise, sprinkle in nutritional yeast and squeeze in lemon juice. Gently toss with a large spoon or spatula. Set bowl aside. Onions + Tempeh. Warm a skillet over high heat and add 2-3 tsp of EVOO to the pan. 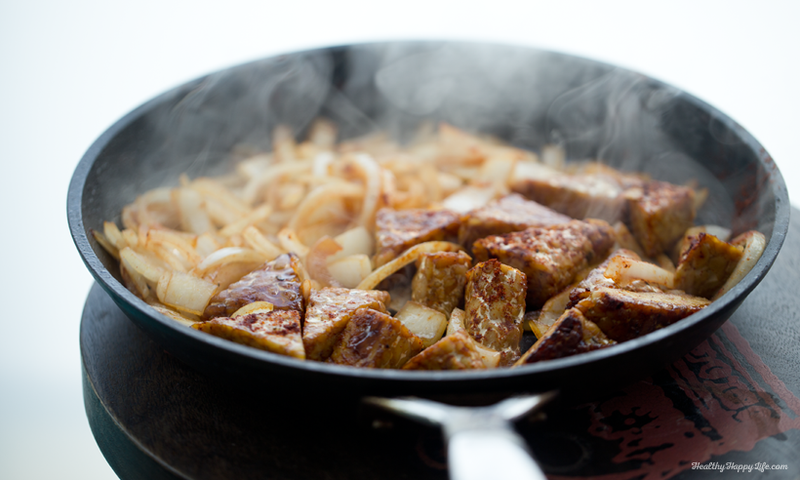 When oil is hot, add the tempeh, including any leftover juices from the marinade that didn't get absorbed.) Saute for five minutes, flipping mid way through. 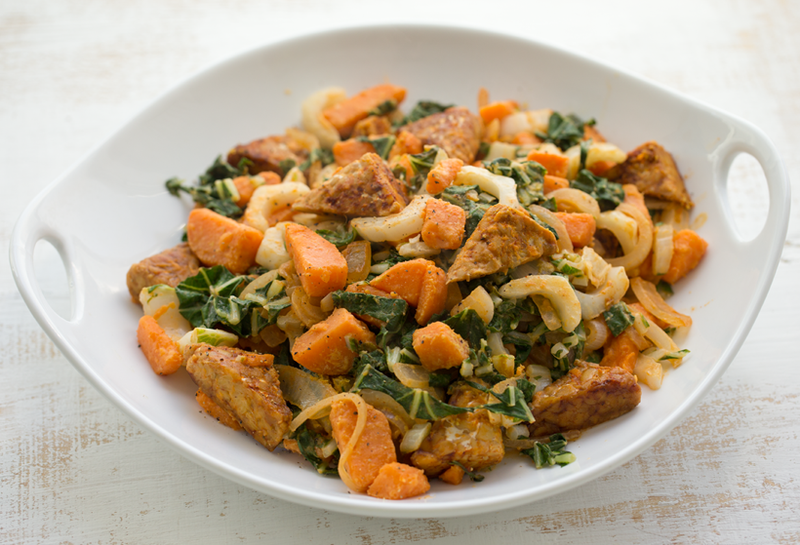 When tempeh is done, sprinkle smoky paprika and cayenne over top to taste, then pour tempeh over top the sweet potato bok choy mixture. Gently fold it in. Whip together the drizzle sauce and drizzle over top. Serve warm right away, or cover with plastic wrap and place in the fridge to chill until ready to serve. Eat within two days. PS. Thank You for the veggie awards support! Vote + enter to win amazing prizes - details here!